One of the many tributes written about Bill. 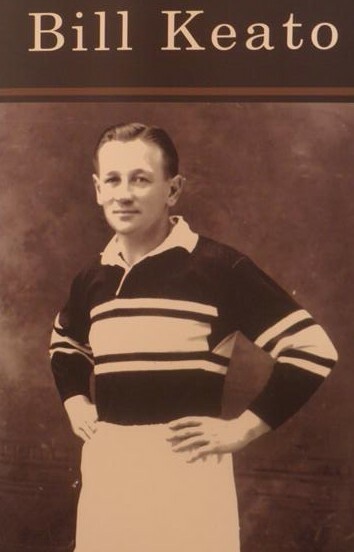 Bill Keato, the diminutive Western Suburbs fullback who has died aged 93, won more matches for the Magpies than any other player. A prodigious goalkicker, Keato booted what were called ''flag waggers'' from the sideline and halfway, often in the mud and against the wind, in the 1938-to-1950 era, when goals, rather than tries, decided games. In 1947, in Manly's debut game at Brookvale, the Sea Eagles scored three tries to Wests' one, but Keato kicked six goals and the Magpies won by a point. ''Bill started it and we've been causing them trouble ever since,'' former Wests secretary Ray Bernasconi said in reference to the Fibro-Silvertail feud. Advertisement Keato died on Monday, the last member of Wests' 1948 premiership team that beat Balmain, today's NRL joint venture partner. A resident of Liverpool, then part of Wests territory, Keato was selected for Wests after playing only one junior game. He soon attracted attention when he sidelined rugby league's best player, Easts' Dave Brown, for two months with a scything tackle that broke the centre's collarbone. He was nicknamed ''Amos'' because, when joined with Keato, it formed ''a mosquito''. He aptly buzzed about the backfield, refusing to tackle high like the other ''flying headlock specialists'', felling the big men as if they had been struck with malaria. His surname was also invented in the same phonetic manner. Bill's grandfather, Samuel, was a Chinese orphan who arrived in Australia aged 14 from Shanghai. When the Customs officer asked Samuel his surname, he responded in Cantonese, ''Yes, that's right'', which, according to family folklore, came out sounding like ''Keato''. So he became Samuel Keato, although other spellings have him as Keto, Cato, Ketas and Keating. Sam married twice, to Englishwomen both named Smith, with Bill related to Clara Keating, the vaudeville actress of the Al Jolson era. Bill certainly shared some of the entertainment genes, being one of the original three who founded Western Suburbs Leagues Club at Ashfield. Oblivious to his own oriental background and devoid of political correctness, Bill often remarked how surprised he was at ''the number of Chinese coming into the club''. Perhaps they were attracted to the club's ''Keato's'' restaurant, which featured a cardboard cut out of him at its entrance. It disappeared last year, only to surface via Facebook, on the Machu Picchu trail in Peru, at the Eva Peron mausoleum in Buenos Aires, with Christ the Redeemer in Rio de Janeiro and at a Che Guevara mural in Cuba. Rick Yabsley, a passionate Wests fan, admits to taking it on a tour of South America and will return it today. Bill's father was an ambulanceman and insisted his son wear light, soft-toed football boots lest he ''strip pieces of skin off the other boys' shins,'' according to one newspaper account. But all goalkickers in those days were toe pokers and Bill knew he needed a hard, right toe. So each Monday he would stuff the toe of his right boot with wet paper and every night spent an hour with a tile layer's trowel modelling a perfect clay toe to the boot. On Friday nights, he baked the toe of the boot in the casing. He always carried two pairs of boots to games and regularly changed his right boot at half-time. The right boot he called his ''tradesman'' boot and his left, the ''labourer's boot'', always digging his divot with the left boot. Generous of spirit, he handed his precious boots to his replacement, Mick Thornton, when he missed the 1947 semi-final with injury, saying, ''You can have my boots for the game, too''. Keato was also a skilled all-rounder at cricket, playing first grade with Cumberland. His 120 first-grade games for the Magpies and 25 in reserves, for 869 points, is a Wests record and could have been more, except for two years spent on war service. He played for City and would have represented Queensland, where he was stationed, had his unit not been transferred. His brother, Alan, a Magpie forward, was killed at Finschhafen. Bill was Wests' inaugural treasurer from 1951 to 1973 and his charitable works were well known, especially for Legacy. And who could blame him for his political incorrectness in an era when institutions had names like the Ryde Home for Incurables, an organisation that received one third of a Lidcombe gate? Bill, whose funeral was held this week, is survived by daughter Judy Brading, sons Billy, Geoff and Kelvin and nine grandchildren. The order of service from Bills funeral. Below is the Eulogy given by Rick Wayde. Rick covers Bills Life and Times at Wests brilliantly. Cheers Rick for letting me use it. REMARKABLY WENT STRAIGHT INTO GRADE AT THE MAGPIES IN 1938 AFTER ONLY ONE JUNIOR GAME, WHICH WAS BASICALLY A ‘FRIENDLY’ FOR HIS ‘HOME TOWN’ OF LIVERPOOL AGAINST THE REDFERN ALL BLACKS. BILL PLAYED 120 OF 138 CLUB GAMES IN FIRST GRADE. AFTER BRIEF STINTS AT 5/8 AND CENTRE, HE MADE THE FULLBACK SPOT HIS OWN. HE REPLACED JIMMY SHARMAN AS THE MAGPIES’ CUSTODIAN. JIM ALSO HAD PASSED ON THE ‘MAGPIES OLDEST FIRST GRADE PLAYER’ TAG TO BILL. IN 2003, JIM SHARMAN WAS OFFICIALLY ACKNOWLEDGED BY THE STATE OF NSW AS A ‘LEGEND’. A TITLE THAT WOULD SIT EQUALLY WELL WITH BILL KEATO. THE GROUND RAN EAST/WEST THEN…THE FULLBACK’S JOB MADE MORE DIFFICULT LOOKING INTO THE AFTERNOON SUN. PLUS THE INTERRUPTIONS CAUSED BY WORLD WAR 2…WITH ‘SARGEANT BILL KEATO’ PLAYING JUST 4 GAMES FOR WESTS, FROM 1943 TO ‘45. WHO WAS ALSO A MAGPIE PLAYER. MANAGED TO COLLECT THEIR FIRST PREMIERSHIP AFTER WESTS HAD PROVIDED THEM TERRITORY, PLAYERS AND JIM CRAIG, THE COACH. AT THE OTHER END OF BILL’s CAREER, PARRA’S INTRO, IN ’47, WAS JUST ANOTHER ‘OBSTACLE’ FOR THE EVER INNOVATIVE WESTERN SUBURBS CLUB, WITH THE EELS TAKING A HUGE SLICE OF TERRITORY WEST OF GRANVILLE…PLUS PLAYERS AND OFFICIALS. THEY ALSO DID THEIR BEST TO ‘PINCH’ BILL, WITH THE DISPUTE RESOLVED, BY THE NSW RL, THANKFULLY, IN WESTS’ FAVOUR. THIS DIDN’T STOP THE MAGPIES, … WITH BILL KEATO’s CONSISTENT CONTRIBUTIONS ONE OF THE MAIN REASONS FOR WESTS’ CONTINUING GROWTH. IN 1948 [BEATING BALMAIN] AND 1950 [LOSING TO SOUTHS]. THE 1950 GRAND FINAL WAS BILL’S LAST GAME. WESTS LOST, NARROWLY, 21-15, WITH A HEAVILY CONCUSSED BILL KEATO KICKING 6 GOALS. IN BILL’S ERA THERE WAS NO THOUGHT OF BEING REPLACED. [SOME OF THE ZAMBUCKS WERE THERE FOR A DAY AT THE FOOTBALL, RATHER THAN ANY PARTICULAR MEDICAL SKILLS]. BILL KEATO WAS INVALUABLE TO HIS TEAM…IN FACT, WESTS’ LEADING POINTSCORER IN SEVEN SEPARATE SEASONS. BILL TOPPED THE COMPETITION’S POINTSCORING TWICE: 1949 AND 1950. HE KICKED 10 GOALS ON ONE OCCASION, DURING AN SCG ‘MATCH OF THE DAY’. BILL’s POINTSCORING PROWESS PROVIDED THE FOUNDATION FOR WESTS’ FIRST CLUB-CHAMPIONSHIP…THE MAGPIES’ FIRST- GRADE NEEDED TO WIN THEIR LAST ROUND GAME v NEWTOWN AT PRATTEN PARK IN 1948…TO CLAIM THE ‘FLOWERS MEMORIAL PENNANT’. TRAILING THE BLUEBAGS BY ONE POINT [15-14],… IN THE WET …WITH TIME RUNNING- OUT,… CAPTAIN DUCK WALSH CALLED-UP BILL FOR A LONG RANGE PENALTY SHOT. AS HE LINED IT UP…. AND REMEMBER. KICKERS OF BILL’S ERA HAD TO MAKE THEIR OWN DIVOTS or BUILD THEIR OWN MOUND..
A ‘WAG’ CALLED OUT, “WHO DO YOU THINK YOU ARE, JIM SULLIVAN?”. BILL KEATO CALMLY POTTED THE GOAL. PERHAPS TAKING SOME OF THE GLOSS OFF BILL’s OUTSTANDING KICK. BEING A LIVERPOOL KID, MADE BILL A WESTS JUNIOR IN 1938. IRONICALLY, IT’S ONLY 6 WEEKS AGO THAT WESTS MAGPIES AND WESTS TIGERS CELEBRATED ’25 YEARS’ AS THE OFFICIAL TEAM IN THE CAMPBELLTOWN/LIVERPOOL AREA, FOLLOWING THE MAGPIES’ FORMAL MOVE THERE IN 1987. BILLY MOVED SEAMLESSLY FROM PLAYER TO CLUB OFFICIAL, BECOMING WESTS’ TREASURER FROM 1951 TO 1973. HIS FIRST-SEASON BONUS WAS ’13 POUNDS’, WITH 2/6 DEDUCTED AS THE CLUB JOINING-FEE. BILL’s WEEKLY WAGE WAS 7/6. A PAIR OF BOOTS; DALLY M’s, MADE TO MEASURE…COST 3 QUID. BY SOAKING BROWN PAPER IN WATER AND PUSHING INTO THE TOE OF THE BOOT. THE CLUB FINISHED THIRD, ELIMINATED IN THE FINAL BY JACK GIBSON’s PREMIERSHIP WINNING EASTS. BILL KEATO REPRESENTED CITY SECONDS v COUNTRY IN 1947, WEIGHING IN WITH 5 GOALS. HOWEVER, BILLY’S ‘IMAGE’ HAS RECENTLY CIRCLED THE GLOBE, JET-SETTING DUE TO SOME STAUNCH MAGPIE SUPPORTERS AND THEIR RESPECT AND AFFECTION FOR BILL’S PLACE IN MAGPIE HISTORY…AND, BY UTILISINGTHE SOCIAL MEDIA SUCH AS FACEBOOK. WHEN BILL’S LIFE-SIZE CUT-OUT DISPLAY DISAPPEARED FROM ‘KEATO’s’ RESTAURANT AT WESTS ASHFIELD…IT MYSTERIOUSLY RE-APPEARED AMONG THE CROWDS AT INTERNATIONAL LANDMARKS…. FROM HAVANA, Cuba TO RIO in Brazil. HIS CONTRIBUTIONS…BOTH ON AND OFF THE FIELD…REMAIN AMONG THE MOST IMPORTANT IN THE 105 YEAR HISTORY OF THE CLUB…AND SO IT WILL ALWAYS BE. MORE IMPORTANTLY, ANY WESTS SUPPORTER WHO WATCHED HIM RUN ONTO THE SCG,…LINE-UP A KICK ON PRATTEN PARK…OR SAW HIS SMILING FACE…OR HAD THE PLEASURE OF CHATTING WITH BILL…OR PERHAPS THE BENEFIT OF HIS ADVICE…WILL CONTINUE TO CARRY THAT INDELIBLE MEMORY OF BILL KEATO.